This effect is achieved by using a solid color (in this case, black) for the background while also adding an image that creates the honeycomb pattern. This is all controlled via the theme's CSS file. Once there, you will see the graphical Style Sheet Editor which outlines all of the various styles contains on the style sheet and allows you to edit them individually. Your store's theme folder contains a "default.css" file as its style sheet. Once you click the "Edit Look/Colors (CSS) button described above, your store will begin using a secondary style sheet called "default_modifed." While in the Style Sheet Editor, look for the "body" style and click on its individual "Action ->Edit" button. Use CTRL-F on your browser to search for the word "body" and find it easier. Look for the "background" field and change its values to suit your needs. Advanced users with a good grasp of CSS can also click on the "Advanced Mode" button located at the top and access the full CSS file in its entirety. no-repeat top center - specifies the image's alignment and display. If you'd like to remove the image, simply edit the field to include only the color's hex value. You can also take this opportunity to edit the background's solid color altogether by specifying your own color choice. Some colors can be referenced by their names instead of hex value. For example, #FF0000 can be substituted with the word "red." Please click here for a listing of colors that can be referenced by name. If you'd like to change the actual image that's being used, simply upload your new image and reference it in the CSS file instead. There are also a few CSS image display options you may use to control how the image is displayed. Please click here for an external reference that contains more information on these CSS tags. repeat-x: image repeats horizontally across the page. This article is provided for informational purposes and guidance. 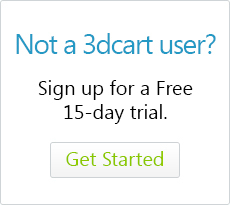 Please be aware that 3dcart technical support is neither able nor qualified to offer support on changing your site's CSS files. If editing your site's look and feel is beyond your capabilities, we have Design Services available that may help. Please check with your sales representative for more details.